Certainly looking more and more possible as weather computer models are starting to output the same solution. The atmosphere will be primed for heavy precipitation as a strong feed of moisture all the way from the Baja in California will be available, along with the Gulf of Mexico streaming its usual moisture, this storm has the potential to drop significant amounts of rain and snow across parts of the Midwest. But Where? Now that I have your attention...we are still 6+ days out and the timing and specific track are in question. 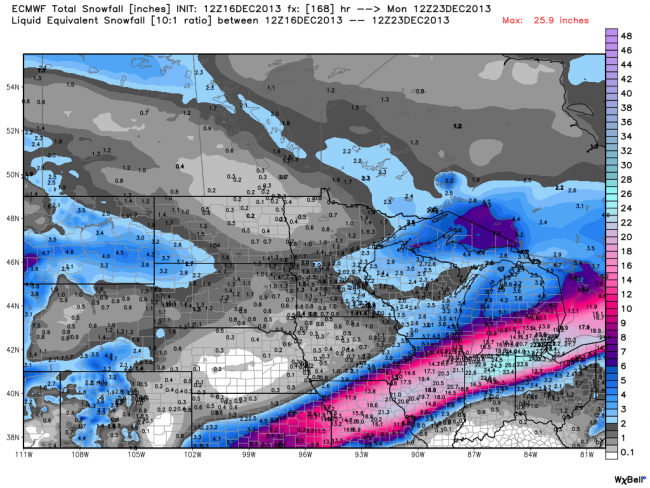 Some models take it near Minneapolis others keep all the snow south of Chicago. We will certainly update as the storm gets closer and models are more consistent. Not to forget about the Thursday storm...where a few inches of snow and maybe some freezing rain will be possible from Nebraska to Michigan, but nothing in comparison the possible weekend monster, stay tuned! !